Slot machines the pros play. 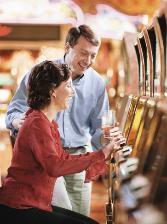 Did you ever want to find out which slot machines have the best returns? With the OpenLabel Calculator you can go up to an OpenLabel slot machine and know the exact payback return percentage. You'll know whether the machine is paying 92%, 98%, or 103%. That's right - OpenLabel slots sometimes return over 100% and you'll know when. Why play any other slot machine? OpenLabel lets you play with knowledge. iFLotto™ displays the latest Powerball and Mega Millions results. The past winning numbers for Powerball, Mega Millions, New York Lotto and Cash4Life are presented. For those who want to see how often each number comes up, an analysis of Powerball, Mega Millions, New York Lotto and Cash4Life is given. Kenolyzer finds the mathematical returns of keno schedules. The game mode has the look and feel of a casino video keno machine. RacingExpectation provides free racing calculators based on mathematical expectations. Copyright © 2014 Pharos Gaming, Inc. All rights reserved.